Click on the thumbnails to see a larger version in a new window. Some of these artworks are for sale, either as originals or as limited edition prints, cards, posters, etc. 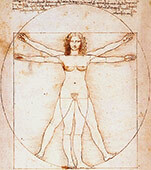 whilst others like the Vitruvian Woman are also available as t-shirts and mugs. Please visit the online shop for details or contact me via e-mail.